We believe some of what hurt us this quarter and calendar year in the Intrepid Balanced Portfolio (the “Portfolio”) was our desire, as always, not to hug our benchmarks, in an effort to shield shareholders from inevitable severe drawdowns (30-50%) that occur every so often in the equity indexes. I had hoped our attempts to diversify away from the richly valued companies in the S&P 500 would work better than they did. Please keep in mind the Portfolio was down 11.23%, net-of-fees, for the quarter ending December 31, 2018. 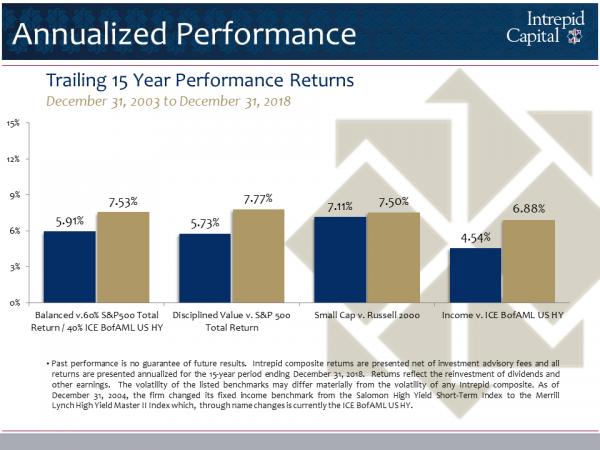 The Blended Benchmark consisting of 60% S&P 500 Index and 40% ICE BofAML High Yield Index declined 9.98%, the S&P 500 Index declined 13.52% and the Russell 2000 Index declined 20.20% for the same period. My job, as I see it, is to try to keep a steady hand on the tiller and, in the words of Rudyard Kipling, not lose my head when all about me are losing theirs. The Martina Navratilova quote is appropriate to this situation. 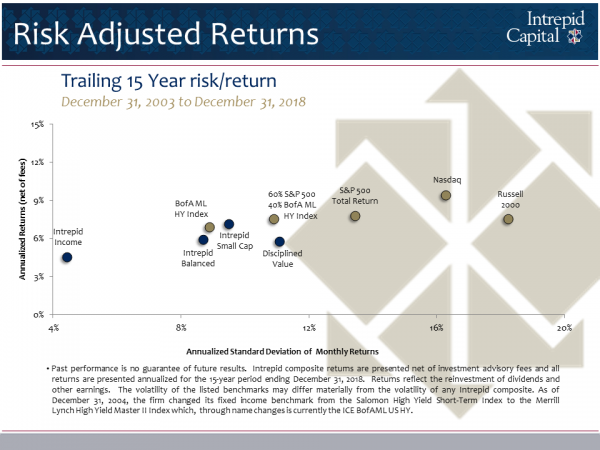 My goal continues to be to keep the equity, fixed income, and cash allocation at levels I believe are appropriate to deliver attractive long-term risk-adjusted results. As of December 31, 2018, the portfolio was 54.6% equity, 38.6% fixed income and 6.8% cash. Despite the general sense of gloominess in the financial world, there were several positive developments at Intrepid during the quarter that I would like to highlight. Our equity strategies all performed at or near the top of their respective peer groups in the fourth quarter as the market rolled over. Our fixed income strategy, as well as the bond holdings in the Portfolio, performed admirably for both the quarter and the year as our focus on short-duration, high-quality corporate debt paid off as rates rose, credit spreads widened, and investment grade and high yield bond markets fell late in the year. There was no magic bullet to fully insulate investors from the widespread selling of the last few months, but we believe our recent results, in a small way, validate our defensive positioning. Speaking of the team, we celebrated the addition, or rather re-addition, of Joe Van Cavage, CFA to the “Intrepid brain trust,” as I like to call our investment team. Joe worked with us briefly as an analyst in 2010 and rejoined the team in December. He will serve alongside Matt Parker, CFA, CPA in managing the day-to-day operations of the Small Cap Portfolio and has already contributed meaningfully to our collective research efforts.